Pavement Pieces correspondent, Elyse Mickalonis, short documentary on the hopes, dreams and issues facing auto workers. Ranglin’ Yankees rough it out to keep western Americana alive. Auctions have felt the effect of eBay and the advent of other online antiquing sites. Guptill’s Arena in Colonie, N.Y. draws in families looking for fun and fitness. Video On Demand looks to make some movies cheaper and more readily available as soon as this month, a move that might impact drive-ins across the country. At the site where a water line break encased cars in ice over the weekend, construction workers shoveled dirt and cement into a gaping East Village sinkhole. 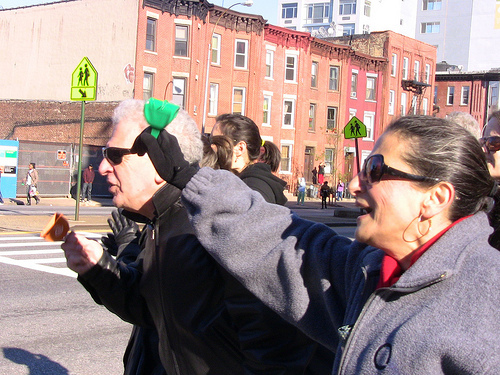 Cowbells clanged in celebration from every direction to welcome the marathon runners to Gowanus, Brooklyn.